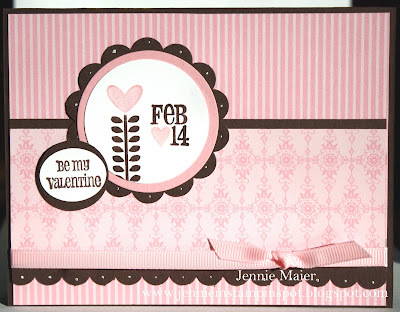 This Valentine was made with the Stamping 411 sketch#188 here. I started with a Basic Black base and added some Riding Hood Red card stock. Then I added some DSP from the Love Letter DSP. 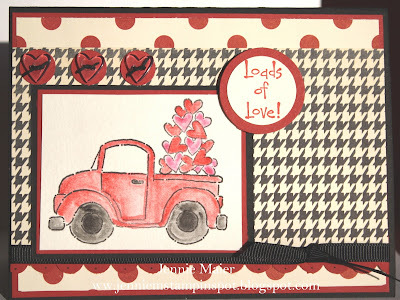 I stamped the truck from Loads of Love on some watercolor paper and colored it in with blender pens and Basic Black, Real Red and Melon Mambo Classic Ink pads. I used the 1/2 inch Circle punch to punch out some Riding Hood Red circles and added some heart buttons from the Bitty Buttons. I ran a strip of Riding Hood Red thru the Scallop Edge border punch. 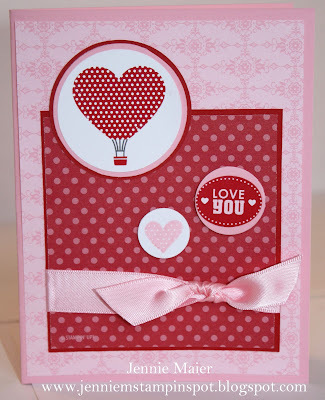 Loads of Love was stamped on Very Vanilla in Riding Hood Red, punched it out with the 3/4 inch Circle punch and layered it onto a piece of Riding Hood Red punched with the 1 1/4 inch Circle punch, all popped up with Stampin dimensionals. Finally, some 1/4 inch Basic Black grosgrain finishes it off. 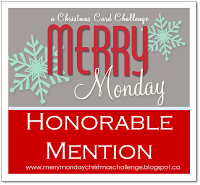 I was inspired to make this card for the Create with Connie and Mary Challenge #135 here. I started by running Pretty in Pink card stock thru the Big Shot with the Vintage Wallpaper textured impressions embossing folder. I used some DSP from the Patterns DSP Subtles Stack. I ran the Chocolate Chip piece thru the Scallop Edge border punch and pierced the scallops with the Paper-piercing tool. I stamped the dress form from Chic Boutique in Chocolate Chip on Whisper White and again on some Pretty in Pink DSP. I colored it in with the Chocolate Chip and Pretty in Pink Stampin Write markers, cut it out and popped it up with Stampin dimensionals. 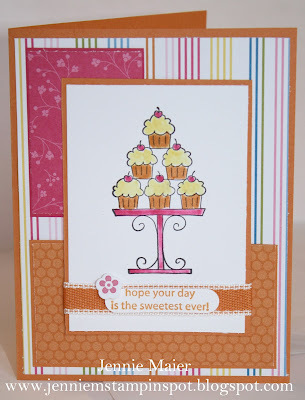 I stamped the flourish in Chocolate Chip, colored it with the Pretty in Pink Stampin Write marker and cut it out. 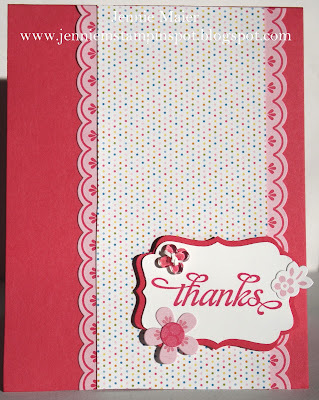 Hello was also stamped in Chocolate Chip but on Pretty in Pink card stock and I punched it out with the 3/4 by 15/16 inch Oval punch, popping it up with Stampin dimensionals. Then I added a Chocolate Chip piece punched with the Decorative Label punch. A 5/8 inch Chocolate Chip Jumbo brad and some 5/8 inch Whisper White satin ribbon finish it off. 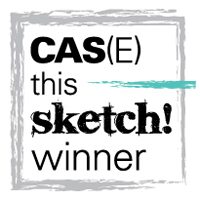 This colorful CAS card was made with the Clean & Simple sketch FTL#125 here and also qualifies for PPA#78 CAS-Bows, here. The base is Crumb Cake card stock. I cut a piece of Early Espresso and added DSP from the DSP Pack In-Color. I stamped the sentiment from So Happy For You in Early Espresso. And finally, I added some 1/8 inch Early Espresso taffeta. This is a Valentine that I made for the Splitcoast Sketch Challenge#317 here and the SUO Challenge #11-Valentine's Day- here. I started by running the Crumb Cake card stock thru the Big Shot with the Square Lattice textured impressions embossing folder. The Pretty in Pink and Real Red DSP came in the Love Patterns DSP but you can still buy them in the Subtles and Brights Patterns DSP Stacks. The balloon heart, little hearts and sentiment are all from the Love Impressions Rub-ons. That's it, no stamping! This one was made with the MojoMonday sketch#175 here. The base is Baha Breeze card stock and I added some DSP from the Springtime Vintage DSP. I used the Circles#2 Big Shot die to cut out the Vanilla and Pear Pizzazz circles and the Coluzzle to cut out the Baha Breeze circle. The 2 3/8 inch XL Scallop Circle punch was used to punch out the Not Quite Navy scallop. 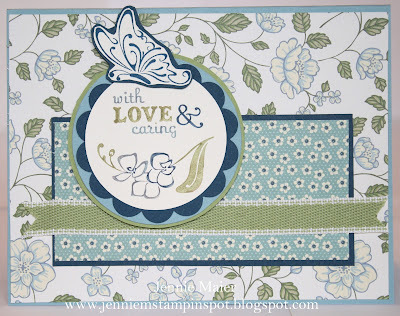 I inked up the stamps from Thanks for Caring with my Baha Breeze, Not Quite Navy and Pear Pizzazz Stampin Write markers. The butterfly was stamped on Vanilla with Not Quite Navy, cut out and layered onto some Not Quite Navy card stock. 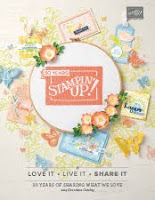 The circles and part of the butterfly were popped up with Stampin dimensionals. Finally, some 1/2 inch Pear Pizzazz stitched-poly ribbon finishes it off. It's Sale-a-bration time so I used the SAB Ice Cream Parlor DSP & Quick Accents with the So Happy for You stamp set to make this card for the Stamping 411 sketch#187 here. It starts with a card stock base of Daffodil Delight and then some Pacific Point. The paper is from Ice Cream Parlor DSP. I ran the edge of the Pacific Point piece thru the Scallop Edge Border punch and added some White gel pen dots. I punched out some Daffodil and Pacific Point circles with the 3/4 inch Circle punch and added some flowers and circles from the Quick Accents, popping them up with Stampin dimensionals. I stamped thanks from So Happy for You in Pacific Point. There's a Bitty Button, with a Daffodil Delight piece punched with the Itty Bitty Shapes Punches pack and threaded with a sliver of Pacific Point. Finally, some 3/8 inch Daffodil Delight taffeta ribbon finishes it off. This one is for the Clean & Simple Stamping FTL#124 here. It starts with a Very Vanilla card stock base and I added some Basic Black. The polka-dot paper is from the Love Letter DSP. I ran a strip of Riding Hood Red thru the Scallop Edge Border punch and added that to the bottom of the DSP. I stamped Amour from Artistic Etchings on Very Vanilla in Riding Hood Red. I punched that out with the 1 3/8 by 5/8 inch Large Oval punch, punched out a Basic Black oval with the 1 3/4 by 7/8 inch Large Oval punch and then a Riding Hood Red oval with the 2 by 1 3/8 inch XL Oval punch. I punched out a Basic Black piece with the XL Curly Label punch and adhered that behind the Riding Hood Red Oval. 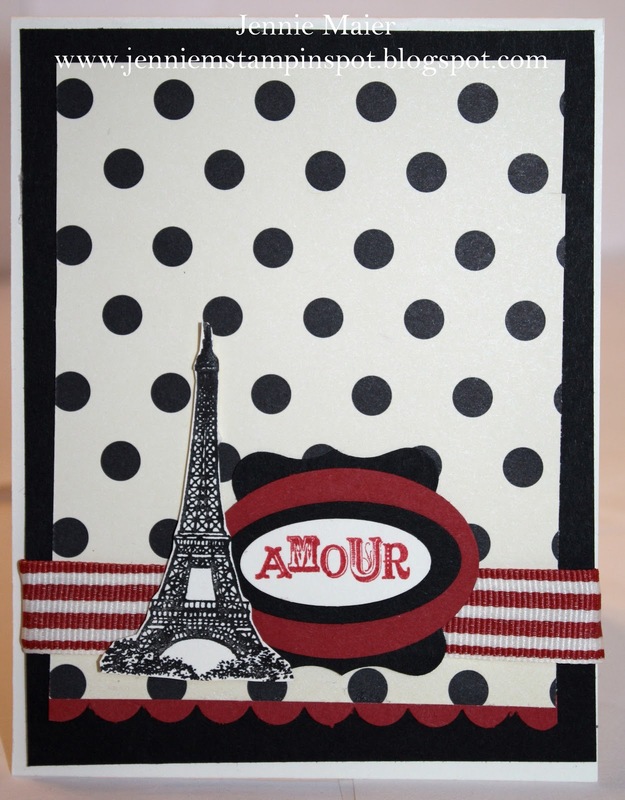 I stamped the Eiffel Tower in Basic Black, cut it out and popped it up with Stampin dimensionals. Finally, a piece of retired, 1 1/4 inch Riding Hood Red striped grosgrain finishes it off. 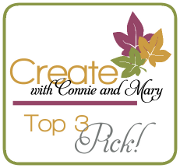 I made this super quick card for the Create with Connie and Mary sketch#134 here. 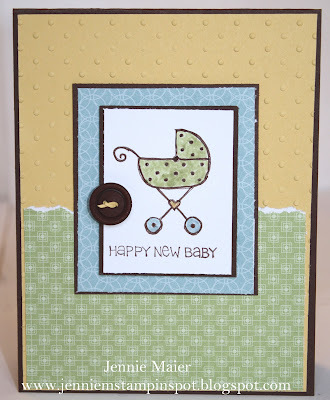 My base is Melon Mambo card stock and I used the paper and die cuts from the SAB Ice Cream Parlor DSP and Quick Accents. The scallops are die cuts and I just adhered them and trimmed them down. Then I added some of the polka-dot DSP. 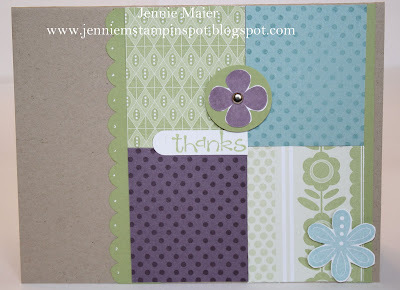 I stamped thanks from Thank You Kindly in Melon Mambo and punched it out with the Decorative Label punch. I then punched out two pieces of Melon Mambo with the same punch and just trimmed them down to create a mat. I added some more die cut flower and dot stickers. I punched a piece of the Melon DSP with the Itty Bitty Shapes punches pack and adhered a Bitty Button, threaded with a sliver of Whisper White. 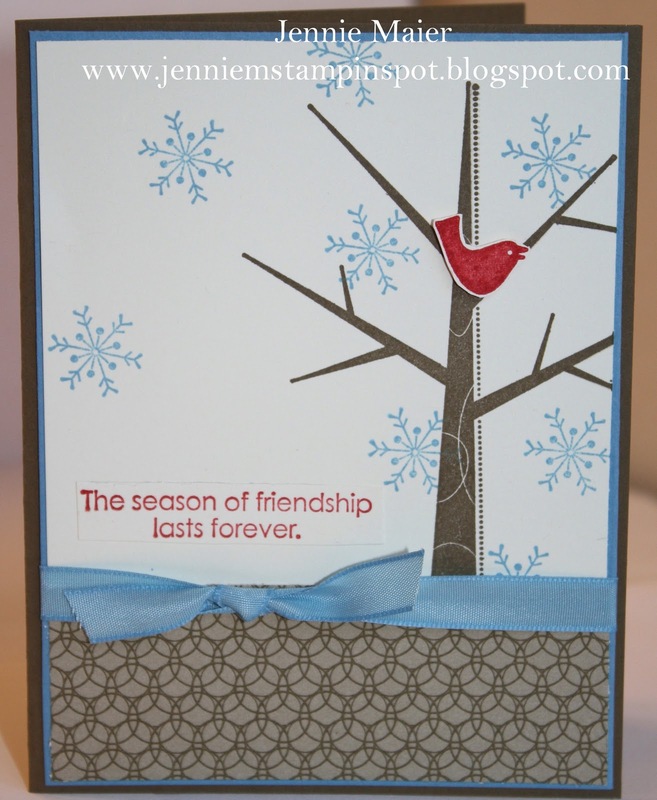 Finally, that whole piece was popped up with Stampin dimensionals. This thank you was made using the PPA#77 Sketch here. 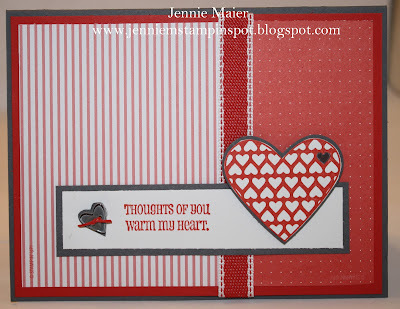 The base is Rose Red card stock and the papers are from Springtime Vintage DSP. I stamped the vine from Vintage Vogue in Pear Pizzazz on Very Vanilla. I stamped the flower in Rose Red in Very Vanilla and cut it out. Thank You from Teeny Tiny Wishes was also stamped in Pear Pizzazz. That was punched out with the 1 1/4 inch Circle punch and layered onto a Rose Red piece punched with the 1 1 3/8 inch Circle punch. The Circles#2 Big Shot die was used for the Pear Pizzazz circle. a bit of the Springtime Vintage DSP was punched with the Itty Bitty Shapes flower punch and adhered to the Bitty Button that was threaded with a sliver of Pear Pizzazz. Finally, a Circle Ice Rhinestone Brad was added to the center of the flower and it was popped up with Stampin dimensionals. Since the Filled with Love promo is almost over (Jan. 24th is the last day to order), I figured I'd make another Valentine. I used the Stampin' Celebration Inspiration Challenge #36 here for my Chocolate Chip and Pretty in Pink color combo. The base is Chocolate Chip and I added Pretty in Pink DSP from the Love Patterns DSP. A strip of Chocolate Chip was run thru the Scallop Edge Border punch. 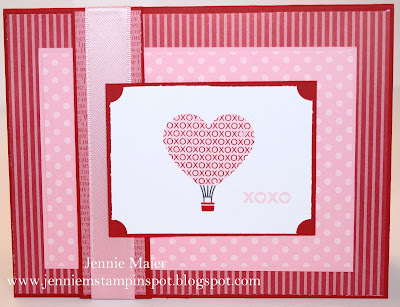 I colored the two stamps from Filled With Love with the Chocolate Chip and Pretty in Pink Stampin Write markers, stamped it on Whisper White and punched it out with the XL 1 3/4 inch Circle punch. I used the Circles#2 Big Shot die for the Pretty in Pink circle and the XL 2 3/8 inch Scallop Circle punch for the Chocolate Chip piece. I stamped the sentiment from Filled with Love in Chocolate Chip and punched it out with the 3/4 by 15/16 inch Oval punch and layered it onto a Chocolate Chip piece punched with the 3/4 inch Circle punch, and popped that up with Stampin dimensionals. I used the White gel pen to add the dots to all the scallops. Finally, a piece of 1/4 inch Pretty in Pink grosgrain finishes it off. This card uses papers from the Sale-a-bration Ice Cream Parlor DSP & Quick Accents Pack. 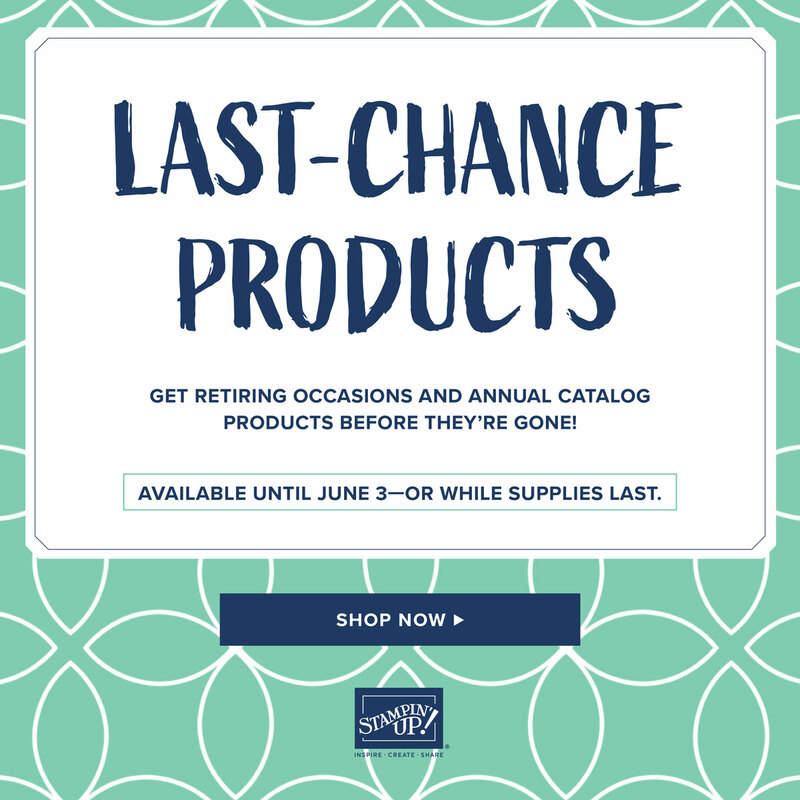 Only 6 more days til you can order and get free products! I also used the Splitcoast Sketch Challenge#316 here. The base is Peach Parfait card stock and I added three of the patterned papers from the Ice Cream Parlor DSP. I stamped the cupcakes from Crazy for Cupcakes in Basic Black on Whisper White. I used blender pens and Daffodil Delight, Melon Mambo and Peach Parfait Classic Stamp pads to color in the image. I stamped the sentiment in Peach Parfait and punched it out with the Word Window punch. I added a piece of 1/2 inch stitched-poly Peach Parfait ribbon. The tiny flower is from the Ice Cream Parlor DSP and Quick accents. 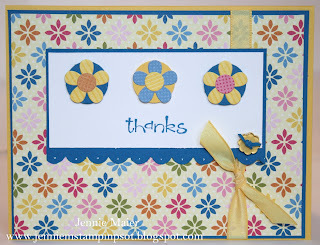 Finally, I popped up the flower and the sentiment with Stampin dimensionals. 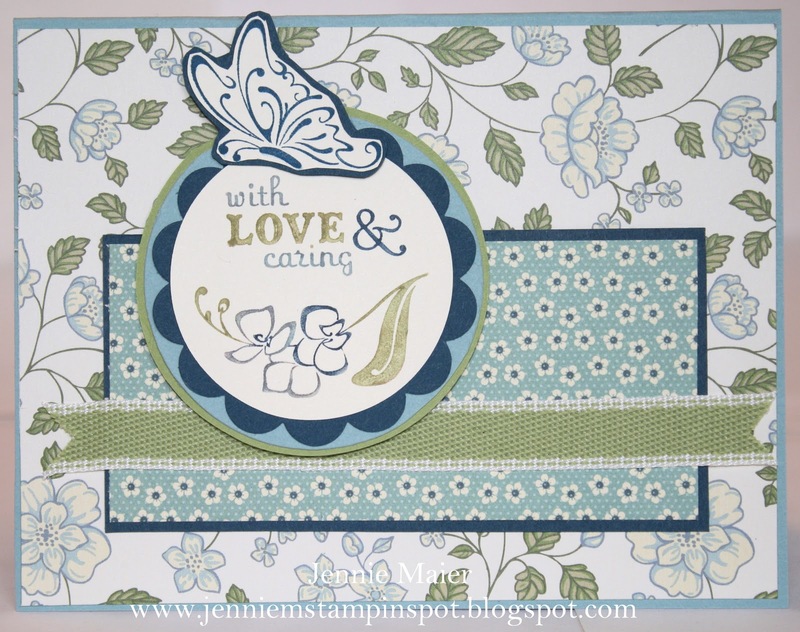 There are only a few days left of the Filled with Love promo so I made another card using the stamp set and Love Patterns DSP. I made it for the MojoMonday sketch#174 here. I started with a Pretty in Pink card stock base and added some Pretty in Pink and Real Red DSP from the Love Patterns DSP. The balloon image is a rub-on from Love Impressions rub-ons and I used the 1 3/4 inch XL Circle punch to punch out the white circle. 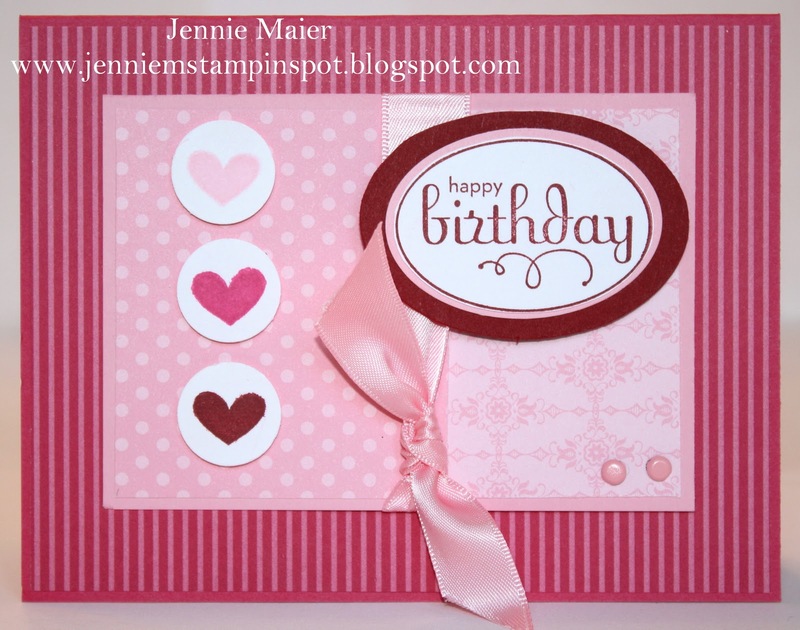 I used my Coluzzle circle cutter for the Pretty in Pink circle and the Circles#2 Big Shot die for the Real Red circle. "Love you" is a rub-on, also from Love Impressions Rub-ons, and I put that on a Pretty in Pink piece punched with the 3/4 by 15/16 inch Oval punch. The little heart from Filled with Love was stamped in Pretty in Pink on Whisper White and punched out with the 3/4 inch Circle punch. Both the little circle and oval were popped up with Stampin dimensionals. Finally, a piece of 5/8 inch Pretty in Pink satin ribbon finishes it off. 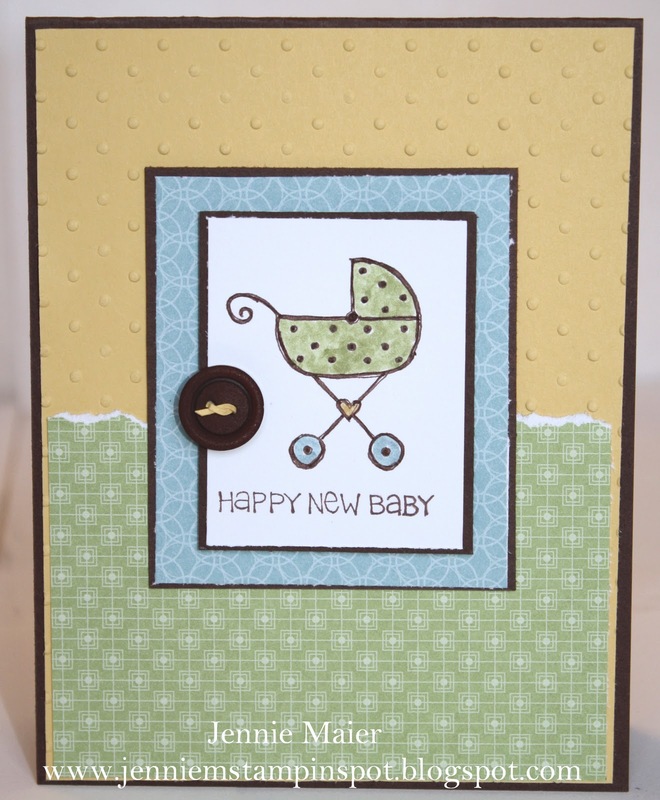 This baby card was made for Stamping 411 sketch #186 here, the Create with Connie & Mary Color Challenge #133 here and qualifies for the SUO Challenge 10, Welcome Baby here. The colors to use are Baha Breeze, Pear Pizzazz, So Saffron and Chocolate Chip. So I started with a card stock base of Chocolate Chip. I ran a piece of So Saffron thru the Big Shot with the Perfect Polka-dot textured impressions embossing folder. I used some Pear Pizzazz DSP from the DSP Pack In-Color and tore the top edge. The rectangle of Baha Breeze DSP is from the Elegant Soiree DSP. I stamped the image from Fun and Fast Notes in Chocolate Chip on Whisper White and used the Baha Breeze, Chocolate Chip, Pear Pizzazz and So Saffron Stampin Write markers to color in the image. I added a Chocolate Chip button that was threaded with a silver of So Saffron. Not much time to stamp today so I used the Clean and Simple FTL#123 here with the Filled with Love stamp set, Love Patterns DSP and Love Impressions Rub-ons. The base is Crumb Cake and I added some Real Red and Pretty in Pink DSP from Love Patterns DSP. I rounded the bottom corners of the base and DSP with the Corner Rounder punch. 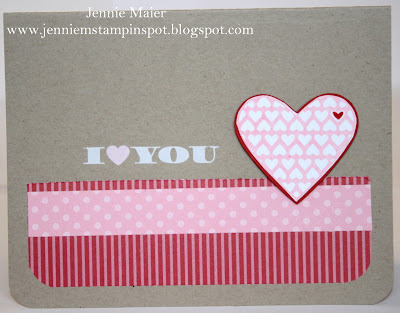 I stamped the heart from Filled with Love in Pretty in Pink, punched it out with the Full Heart punch, colored the little heart with my Real Red Stampin write marker and trimmed it down. 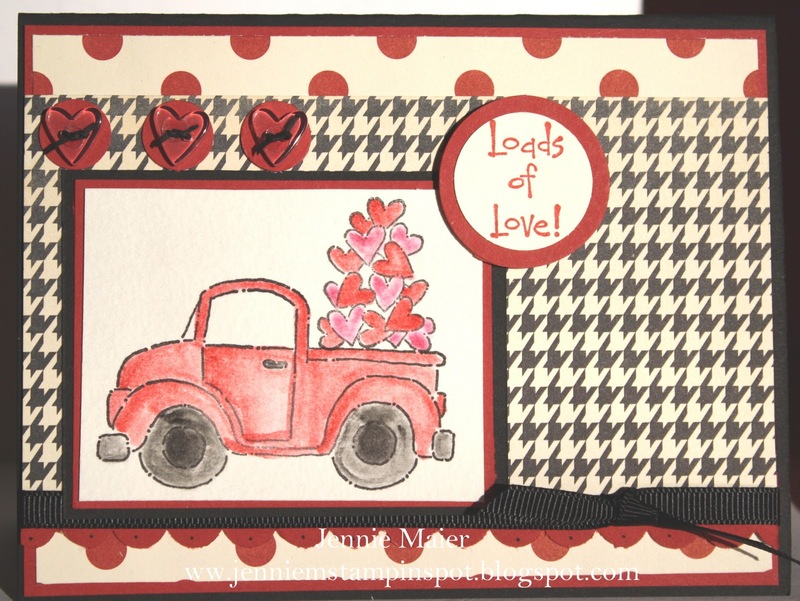 I added a Real Red piece punched with the Full Heart punch and popped it all up with Stampin dimensionals. I used the rub-on from Love Impressions rub-ons for the sentiment. 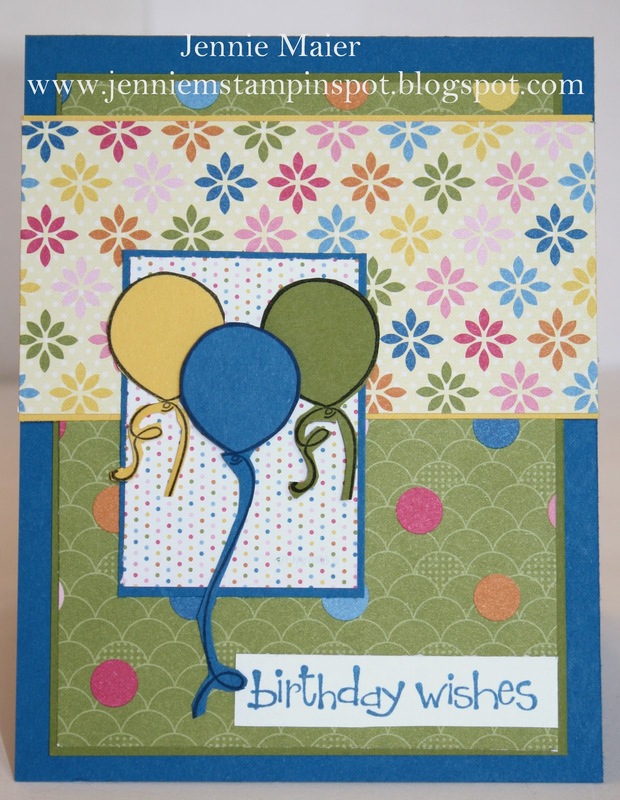 It's only 10 days until Sale-a-bration and thought I'd share a card using some SAB goodies. 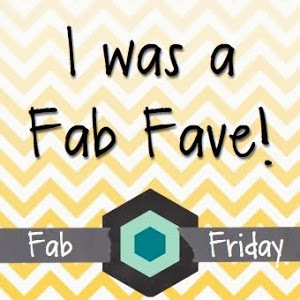 I found this great blog, Stampin' Celebration, that features weekly inspiration challenges and I just had to play with this week's challenge. 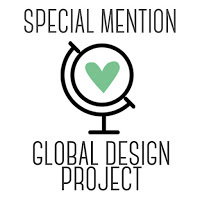 See SCIC#35 here. I also used an older Splitcoast sketch#312 here that I hadn't used due to the craziness of the holidays. I started with a base of Pacific Point, added some Old Olive and Daffodil Delight behind some Ice Cream Parlor DSP from the SAB brochure. Even the little rectangle has more DSP from Ice Cream Parlor. I stamped the balloons from Crazy for Cupcakes with Basic Black on Daffodil Delight, Pacific Point and Old Olive and cut them out. 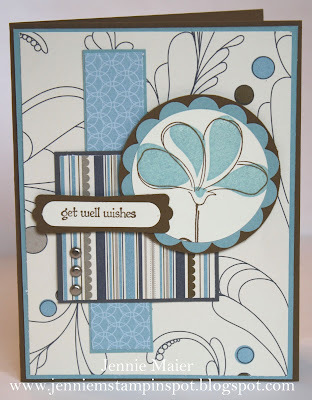 The Pacific Point one is popped up with Stampin dimensionals. Finally, the sentiment from another SAB set, So Happy For You, was stamped in Pacific Point on Whisper White. This Valentine was made for two challenges. First, the PPA#76 Valentine Inspiration Challenge here, and second, the Splitcoast Card Sketch#315 here. I just flipped the sketch on it's side. The base is Real Red card stock. I used some Pear Pizzazz DSP from the DSP Pack In Color for the middle panel, adding two tiny strips of Pear Pizzazz card stock to the ends. I ran a piece of Early Espresso thru the Big Shot with the Perfect Polka-dots textured impressions embossing folder. I colored in the heart with the Real Red Stampin Write marker and the stem with the Pear Pizzazz Stampin Write marker and stamped that on Whisper White. Love was stamped in Real Red. I stamped the circle hearts in Early Espresso, punched them out with the 3/4 inch Circle punch and popped them up with Stampin dimensionals. All those stamps are from Filled with Love, still on sale thru January 24th. Finally, some 1/8 inch Real Red taffeta ribbon finishes it off. This card was made for the MojoMonday sketch#173 here and the Splitcoast Color Challenge#305 here. The colors are Cherry Cobbler, Pretty in Pink and Melon Mambo. I started with a base of Melon Mambo and added some DSP from the Patterns Brights Stack. Pretty in Pink card stock was layered with some DSP from the Love Patterns DSP. I used the heart stamp from the SAB set, So Happy For You, and stamped it three times in Pretty in Pink, Melon Mambo and Cherry Cobbler. I punched them all out with the 3/4 inch Circle punch and popped them up with Stampin dimensionals. Happy Birthday from Perfect Punches was stamped in Cherry Cobbler and trimmed down. A Pretty in Pink piece was punched with the XL 2 by 1 3/8 inch Oval punch. 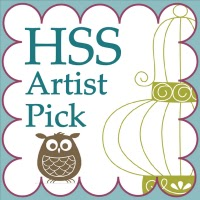 That was layered onto a Cherry Cobbler piece cut with the Coluzzle Oval cutter and popped up with Stampin dimensionals. Two Pretty in Pink brads were added to the corner. Finally, some 5/8 inch Pretty in Pink Satin ribbon finishes it off. This is my take on the Stamping 411 sketch#185 here. The base is Soft Suede card stock then I added some Marina Mist. The bottom has some Elegant Soiree DSP. On the big Very Vanilla piece, I stamped the tree trunk from Season of Friendship in Soft Suede. Then I added some snowflakes in Marina Mist. I added the sentiment in Real Red and stamped the bird in Real Red, cut it out and added a Stampin dimensional. Finally, some 3/8 inch Marina Mist taffeta ribbon finishes it off. No Stamping on this Card! 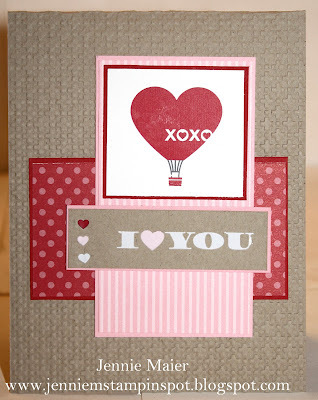 Here's a quick Valentine card that uses the Splitcoast sketch#314 here and doesn't have any stamping. I used the Love Impressions Rub-ons from the Occasions Mini. I started with a base of Real Red and added some DSP from the Love Patterns DSP. Then there's Pretty in Pink and more DSP from Love Patterns. I used the balloon rub-on and the XOXO rub-on from the Love Impressions rub-ons and added that to the Whisper White piece that I used the Ticket Corner punch on the corners. Some more DSP was used on the long piece and some 5/8 inch Pretty in Pink Satin ribbon finishes it off. This is one for two challenges, PPA#76 here and the Clean & Simple FTL#122 here. I started with a Crumb Cake card stock base. The Pear Pizzazz papers are from the DSP Pack In-Color. I stamped Dot Dot Dot on the Baha Breeze card stock in Baha Breeze ink and on the Perfect Plum card stock in Perfect Plum ink. I stamped the flowers from Printed Petals in Perfect Plum and Baha Breeze and cut them out. The Perfect Plum one was adhered to a Pear Pizzazz circle punched with the 3/4 inch Circle punch. A silver brad was added to the center and it all was popped up with Stampin dimensionals. 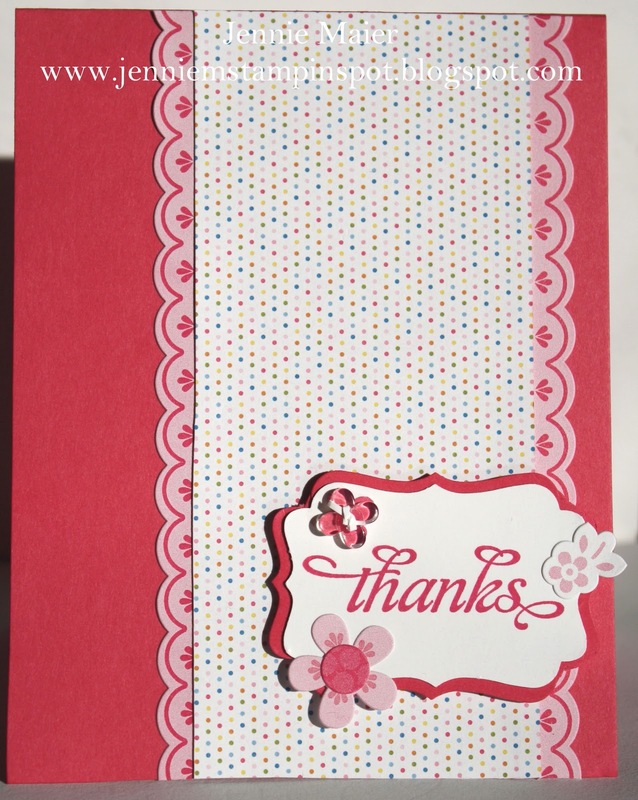 "Thanks" from the SAB set, So Happy For You, was stamped in Pear Pizzazz on Whisper White and punched out with the Word Window punch. The strip of Pear Pizzazz on the left was run thru the Scallop Edge Border punch and I added some dots with the White Gel pen. I made this Get Well card with the MojoMonday sketch# 172 here. I started with Soft Suede card stock and added some Baha Breeze. The papers are from Elegant Soiree DSP. I stamped the flower from Awash with Flowers first in Soft Suede then filled it in with Baha Breeze. I layered that onto a Baha Breeze piece punched with the XL 2 3/8 inch Scallop Circle punch and a Soft Suede circle cut with the Circles #2 Bigz die. Those circles were popped up with Stampin dimensionals. The sentiment from Teeny Tiny Wishes was stamped on Very Vanilla in Soft Suede and punched out with the Word Window punch and layered onto a Soft Suede piece punched with the Modern Label punch, again popped up with Stampin dimensionals. Finally, three silver brads were added to the striped DSP. Here's another card using the Filled With Love set that is on special thru Jan 24th. It doesn't use the papers on sale, rather it uses Poppy Parade, Basic Gray and Whisper White for the Splitcoast Color Combo# 304 here. I also used the Splitcoast Sketch Challenge #313 here. The base is Basic Gray card stock and then I added some Poppy Parade DSP from the DSP Pack In-Color. I stamped the heart from Filled With Love in Poppy Parade on Whisper White, punched it out with the XL Full Heart punch and trimmed it down. I added a piece of Basic Gray punched with the Heart punch. I colored in the small heart with my Basic Gray Stampin Write marker. Stampin dimensionals pop up the heart. The sentiment was stamped in Poppy Parade. 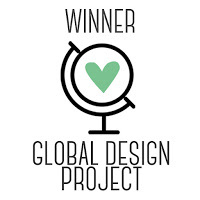 A piece of Basic Gray was trimmed into a heart and a Bitty Button heart, threaded with a sliver of Poppy Parade was adhered to the Gray heart. Finally, a piece of 1/2 inch Poppy Parade stitched-poly ribbon finishes it off. Occasions Mini Catalog is up for sale! Happy New Year! I'm happy to be back stamping again after all the holidays. And also happy that the Occasions Mini Catalog is up for sale today! So I made this card using the Springtime Vintage DSP and the Stamping 411 sketch#184 here. 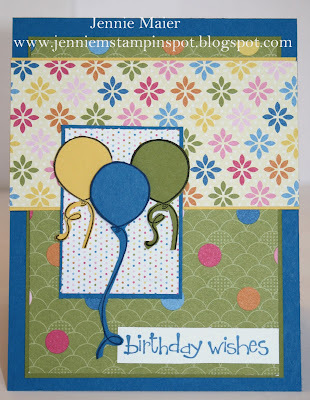 I started with Pear Pizzazz card stock then added the striped DSP from Springtime Vintage DSP. I ran a strip of Rose Red thru the Scallop Trim Border punch and added that to some more of the Springtime Vintage DSP. 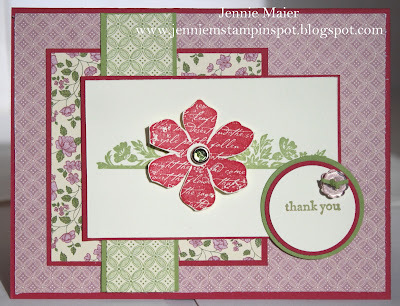 I stamped the For You Flower in Rose Red and punched it out with the XL Fancy Flower punch. 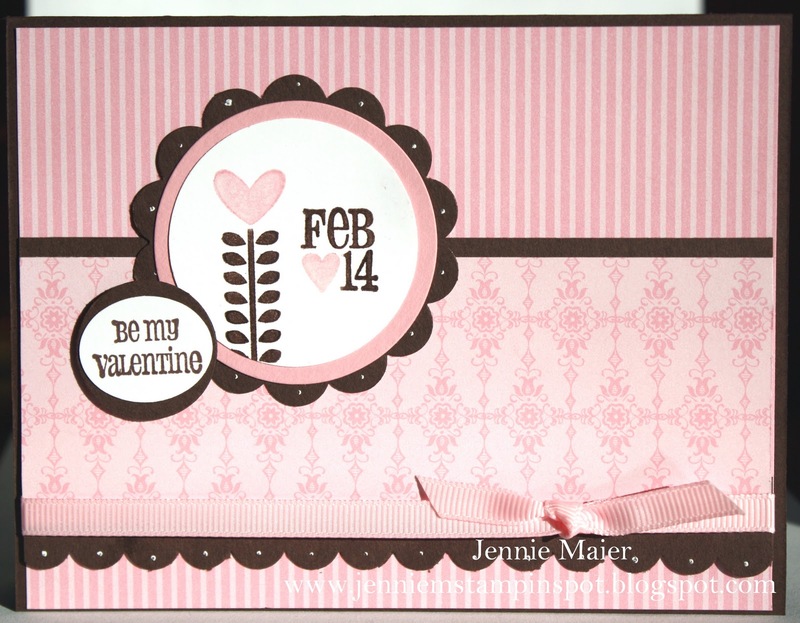 I stamped the For You Flower again in Pear Pizzazz, colored the heart with the Rose Red Stampin Write marker and punched it out with the 1 1/4 inch Circle punch. I added a Pear Pizzazz piece punched with the 1 3/4 inch Circle punch. The entire flower was popped up with Stampin dimensionals. I stamped the tag from Tiny Tags in Rose Red. 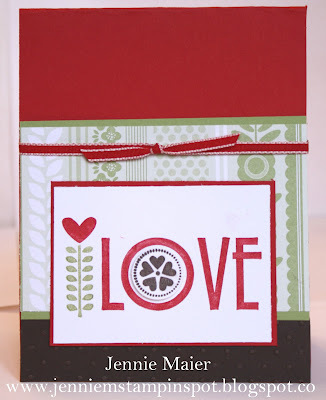 The cherry from On a Pedestal was colored with the Rose Red and Pear Pizzazz Stampin Write markers. That was punched out with the Medium Jewelry Tag punch and threaded onto some Natural Hemp Twine. Finally, a Pear Pizzazz piece punched with the Modern Label punch with a Rose Red brad was added to the flower panel.